Watching the motorcycle business of Polaris Industries evolve over the past few years has been compelling, and, as the corporation balances how Victory Motorcycles coexists with Indian Motorcycle, it’s now well on its way to becoming fascinating. Polaris’ re-launch of the Indian Motorcycle brand in 2013, with the debut of the all-new Chief lineup, rocked the cruiser world. It was a Herculean task to bring the legendary Indian brand from nothing to a lovely bespoke engine and aluminum chassis only two years after Polaris acquired it. The platform was so good out of the box that even the Harley-Davidson faithful seemed to respect it. In fact, this was the subject of a previous Duke’s Den. The massive splash Indian created made me wonder where the Victory brand would find room to play in the Polaris org chart. “We see the brands going this way,” Polaris’ VP of Motorcycles, Steve Menneto, told me at the Chief’s launch, splitting his hands apart in different directions. Menneto noted the Victory brand would be pointing in the direction of a younger demographic, hinting at sharper and sportier models than what would come from Indian. Victory’s new stunt team of Tony Carbajal and Joe Vertical (pictured) is another tactic for Victory to reach a younger demographic who is excited by performance. Amazingly, the Chief platform was followed just one year later with the exciting Scout, an excellent alternative platform with its own bespoke V-Twin motor and aluminum chassis. At the time, I wondered aloud if the Scout was intended to be the next Victory platform before the Indian acquisition. 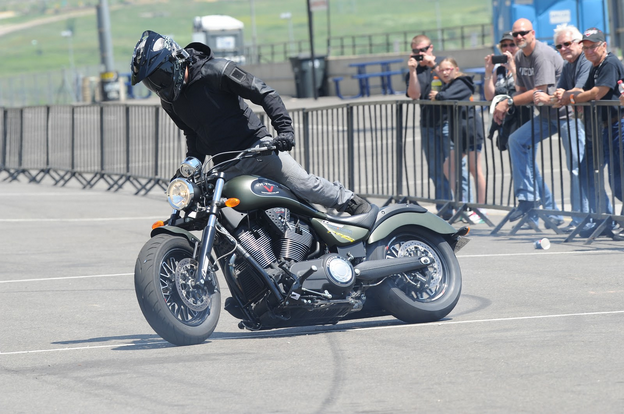 The Scout was so good that it took on and won against six other cruisers, including the iconic H-D Sportster, in our Bout With A Scout shootout last September. With so much focus on Indian, we wondered how much life remained in the Victory nameplate. Plenty, it turns out. American muscle and American performance are Victory’s new taglines, and the company has recently taken several steps toward that new mantra. Last October, it was proposed to Victory’s General Manager, Rod Krois, that Victory should enter the NHRA Pro Stock dragracing category, which was quickly green-lit for the 2015 season. Engaging Matt and Angie Smith to race a Victory-branded Pro Stock bike was a relatively simple way for Victory to leverage its new performance bent. Victory’s American muscle theme on display at the American Victory Rally held earlier this summer in Colorado. NHRA Pro Stock racer Matt Smith launches his dragbike a low-7-second pass down Bandimere Speedway’s quarter-mile strip. 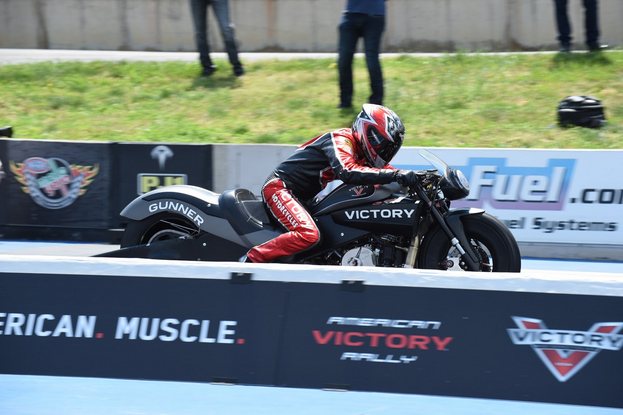 Then, last January, Polaris purchased Brammo’s motorcycle business, culminating in the recent launch of the Victory Empulse TT, which was held at a roadrace circuit – quite a departure for Victory. 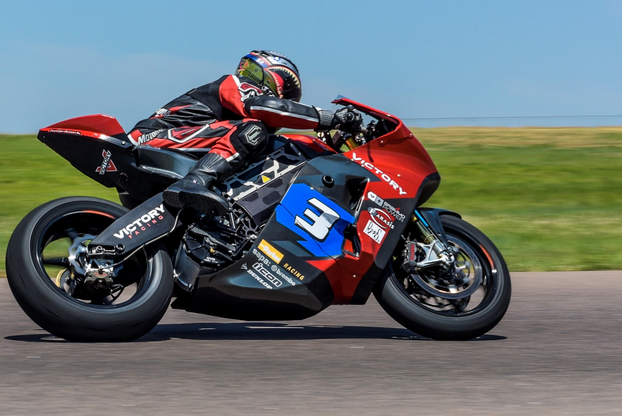 The Brammo acquisition also brought forth Victory’s entry to this year’s Isle of Man TT races in the TT Zero electric class where rider Lee Johnston finished on the podium behind the pair of high-dollar Mugens. Keep your browser tuned to MO so you can see my ride report on the Victory electric bike that finished on the TT Zero podium at this year’s Isle of Man races. I saw 145 mph on its speedo while testing at High Plains Raceway in Colorado. Meanwhile, the gestation of what became known as Project 156 began in February of this year. To my eyes, this is the most interesting new Victory development of them all. 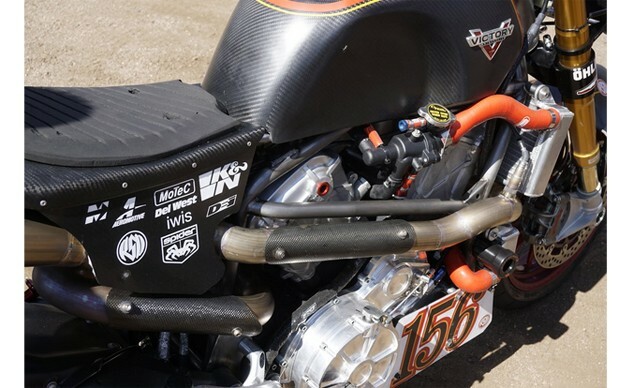 Project 156 (named for the number of corners in the Pikes Peak International Hill Climb) is a collaboration between Polaris and Roland Sands, who teamed up to build a naked sportbike to race in the hill climb last June, and it’s a real work of art. It’s builtd around a one-off chromoly frame from the Roland Sands Design crew, with a fairly steep rake (less than 24.0 degrees) and a short 98mm of trail, according to Sands himself. If you look closely, you’ll recognize a swingarm, fork and upper triple clamp from a Ducati 899. The lower triple clamp has three sets of holes for fasteners, but Project 156 uses only two sets as a way to tune chassis flex. 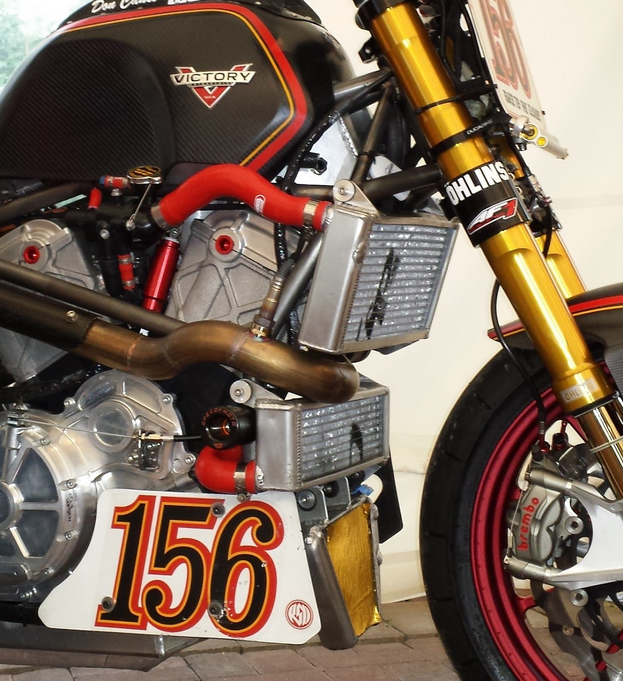 The racebike is said to weigh in the mid-400-lb range. The billet-aluminum crankcase and sand-cast cylinders of Victory’s Project 156 would never make it to production, but I’ll be very surprised if we don’t see a variation of this mill in a Victory streetbike within the next two years. Packaged within its 59-to-60-inch wheelbase is the real star of the show, a liquid-cooled Twin with cylinders separated in a 60-degree vee. Wait, isn’t the Indian Scout’s motor a 60-degree V-Twin? Surely this is indication Victory will use a version of the Scout’s motor in an upcoming model, right? “There’s bits and pieces in that motor from Polaris, for sure,” admitted Gary Gray, Product Director for Victory and Indian. “It’s certainly a Polaris engine,” he continued vaguely, refusing to take the bait when I surmised that a version of that engine would be a perfect fit into Victory’s performance ethos. I don’t see how Polaris could put a Victory badge on Project 156 and not eventually use a version of that motor in an upcoming Victory model. If it does, don’t expect to see the billet engine case or the rumored 170 crank horsepower of the race motor. Both the bore and the stroke were opened up from the Scout’s 1133cc displacement, perhaps enough to approach 1300cc if my reading between the lines is accurate. Accommodating for emissions and durability concerns assuredly will lop off considerable power, but I think I’d be happy with 130 hearty horses and 75 lb-ft of torque when measured at the rear wheel. “As people see new bikes coming out in the future from Victory, you’re going to see more crispness, more sharpness around American muscle and American performance,” Gray continued, noting how Project 156 fits with Victory’s refocused intentions. “Victory always had a general brand clarity around performance, but it’s never been as sharp as it is now. Now that we have Indian and we’ve re-looked at the Victory brand, it’s sharper and crisper and clearer than ever. 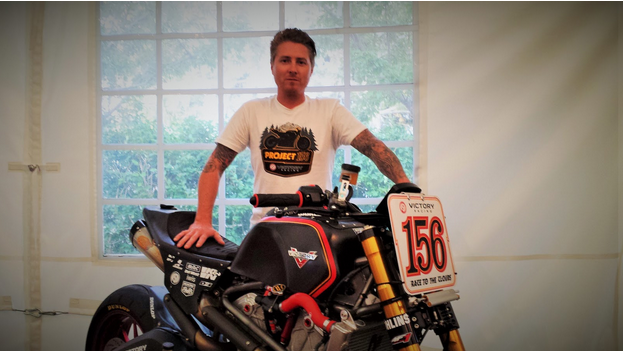 Roland Sands has built dozens and dozens of custom motorcycles, but I believe he’s most proud of Project 156. When I asked Sands who gets to keep the bike after its race career is over, he glanced up slowly and grew a boyish s#*t-eating grin that revealed he’d be taking it home eventually. Cross your fingers Victory will design a variant for streetbike production. Gary Gray has been working on Polaris two-wheelers since the first Victory, some 19 years ago. Today, as Project Director, when he thinks something is really good, he’s got the organizational horsepower to make it a reality.